Inspector-General of Intelligence and Security, Ian Carnell, has called on the Federal Government to make substantial changes to anti-terrorism laws, saying some of them can hinder counter-terrorism efforts by unnecessarily antagonising Muslims. Mr Carnell said there was a strong case for reviewing the strict rules that keep "national security" information secret in trials. "My belief is that a key test for liberal democracies in the area of counter-terrorism is a willingness to revisit what was introduced when there was a sense of urgency and, if necessary, modify the measures to ensure effectiveness, balance and proportionality," he said. "This is particularly so if some aspects may be counter-productive, such as adding to the sense of alienation and discrimination which members of the Muslim communities can suffer." An alienated Islamic community not only provided more fertile ground for violent extremists to emerge, but discouraged Muslims from providing counter-terrorism authorities with vital information. [However] Mr Carnell ['playing the game'] has simply recommended the repeal of the vaguely worded offence of "associating" with a terrorism group, which carries jail terms of up to 10 years. The offence can cover those who have an innocent relationship with suspected terrorists or groups, and Mr Carnell believes the offence transgresses human rights and interferes with "ordinary family, religious and legal communication". He also called for the process of proscribing a terrorist organisation to be taken out of the hands of the attorney-general. "Action on the recommendations is needed," he said. [Allegedly], the intervention by Mr Carnell comes as the Federal Government stalls on plans to amend the anti-terrorism laws, while lawyers and judges involved in terrorism trials continue to express disquiet about them. 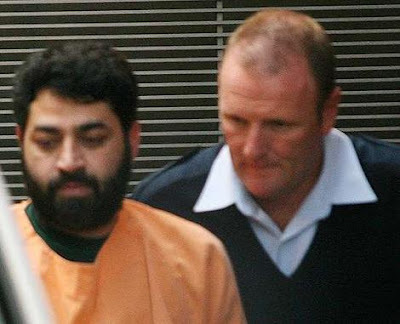 Justice Anthony Whealy, who conducted the [sham] trial of Faheem Lodhi and is now presiding over the trial of nine Sydney men charged with terrorism offences, has been notably vocal. Mr Carnell said this "trenchant criticism … surely points to it being ripe for review". The act - which dictates what evidence can be presented in open court, including whether defence teams have access to it at all - has resulted in lengthy delays before terrorist suspects appear before a jury. In the case of the nine Sydney men before Justice Whealy, it has been 2½ years since they were arrested, and it is expected to take at least another three months before a jury is empanelled.